Whitestone Bridge to Hutchinson Pkwy North to Exit 13 (Cross County Pkwy). Continue Approx. 2 miles take exit for Bx. River Pkwy North to exit 3 (Elm St.). Go 100 feet make a Left. Second Stop sign make a left onto Lake Ave. Angelina’s is on your left..
Bronx River Pkwy. North to Exit 3 (Elm St.). Go 100 feet make a left. Second stop sign make a left onto Lake Ave. Angelina’s is on your left. Bx. River Pkwy. South to Scarsdale Rd Exit 4 (Tuckahoe). There is a light at this exit. Make a right exit and proceed to stop sign, make a left (Parkview Ave.) going towards Tuckahoe Rd. follow road to light and make a left. Follow to the one way sign and make a left onto Armourville Ave. Past the stop sign Angelina’s is on your left. Take 87 North to Exit 6 (Tuckahoe Rd. East). Make a left onto Tuckahoe Rd., follow for 2.5 miles. 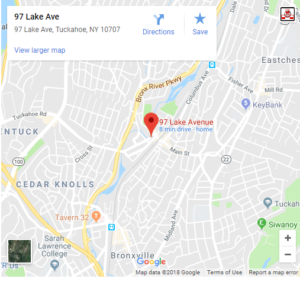 You will enter the village of Tuckahoe, Follow to the one way sign and make a left onto Armourville Ave.Past the stop sign Angelina’s is on your left. Hutchinson Pkwy. South to Cross County Parkway WEST to Bronx River Pkwy North to Exit 3 (Elm St.) Go 100 feet make a left. Second stop sign make a left onto Lake Ave. Angelina’s is on your left. View our events page for special hours on holidays and special events.